A version of this article will appear in the forthcoming edition of Heritage and Destiny. Click here to subscribe. 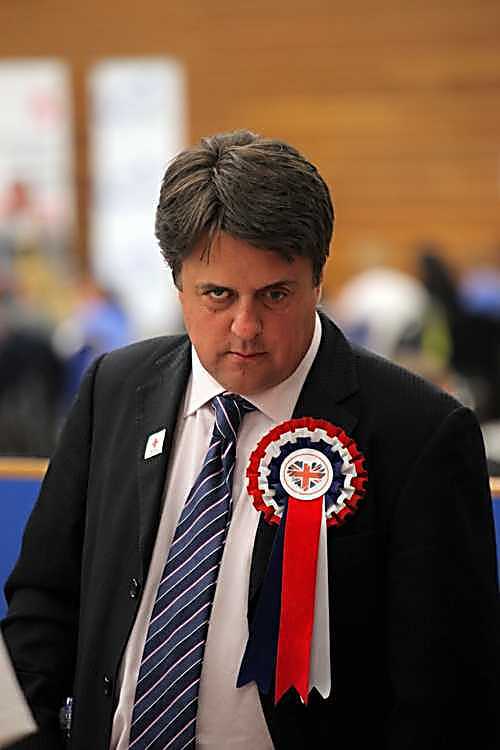 Nick Griffin struggling to think up excuses as he contemplates election disaster in May 2011. The BNP has been in acute crisis since March 2010, complicated by the chronic conditions that afflict any movement, party or faction headed by Nick Griffin. This crisis has now produced electoral disaster. Outstanding local organisers and councillors such as Michael Coleman in Stoke-on-Trent have been turfed out of office, not by the usual ebb and flow of political fortune, but by a cataclysm which leaves their party facing electoral oblivion. This cataclysm was evident at the very start of the local election campaign, when the party failed even to field candidates in numerous wards which were not only winnable, but had in the recent past actually elected BNP councillors. Ray Johns in Cheshunt Central ward, Broxbourne (where his colleague Steve McCole contested ex-Cllr Johns’ old ward of Rosedale). In Oldham, where Nick Griffin made his name at the 2001 general election and where the BNP once seemed certain to win council seats, the party was unable to field a single candidate this year. Those nationalists temperamentally inclined to see a silver lining to every cloud might have hoped that the drastic reduction in the number of BNP candidates this year might at least allow the party to concentrate its resources and achieve improved results in those wards being contested. Moreover in one sense there was an ideal propaganda opportunity. Last year’s council elections had coincided with a general election, boosting turnout and depressing the percentage poll of BNP candidates across the board. So it was logical to expect that – all other things being equal – there would in most cases be a slight improvement on the 2010 share of the vote for BNP council candidates. In one or two cases this did indeed happen. Even the tiny national socialist British People’s Party saw a slight increase in its poll in Todmorden ward, Calderdale, from 4.9% to 5.6%. A more substantial improvement was recorded by Mark Cotterill of the England First Party in Ribbleton ward, Preston, whose vote increased from 12.5% to 15.5%. While in Queensbury ward, Bradford (one of only two BNP successes nationwide) Cllr Mrs Lynda Cromie polled 34.8%, up from the 30.8% achieved by her husband Cllr Paul Cromie last year, though not quite back to the 36.6% and 38.5% polls the Cromies achieved when first elected in 2007 and 2006. The only other BNP success was in the Leicestershire borough of Charnwood, where Cllr Cathy Duffy retained East Goscote ward, a village built on the site of a vast wartime arms depot. Mrs Duffy’s victory (by a majority of just five votes) reflected a substantial personal vote built up over four years of effective council work. Her percentage vote increased from 36.9% in 2007 to 42.3% this year. Across Charnwood the BNP contested only three wards compared to a slate of fourteen candidates at the borough’s previous election in 2007. In the vast majority of council wards contested by the BNP in contrasting wards across England, whether no hope wards, realistic targets, or even former BNP controlled wards, the party saw a significant fall in its share of the poll – not only by comparison to its best years, but even by comparison to what was then seen as a very poor year in 2010. The BNP’s main target ward nationwide was Hapton with Park, Burnley, where between 2008 and 2010 the party held all three council seats. This year former Councillor Derek Dawson was heavily defeated, polling just 20.8%, down from last year’s 24.2% and more significantly well down on the 38.6% achieved as recently as 2008. (Don’t forget that even in 2009 the BNP also won the county council division which includes this ward.) At its peak the BNP was able to poll more than 40% here. Indicative of the collapse of the BNP’s campaigning resources was the fact that away from the main target ward, Burnley BNP’s results were even worse. In Gannow ward, another where the BNP had won council seats in 2002, 2003 and 2006, David Shapcott polled 11.9%, less than half last year’s already mediocre 24.0% and less than a third of the party’s best performance in the ward, which was 38.6% in 2003. While in Coalclough with Deerplay, a ward which Burnley BNP has never won but where BNP candidates have sometimes been a close second, Angela Vanns finished bottom of the poll with a mere 8.9%. Burnley could be seen as a former BNP stronghold which has fallen on hard times, and therefore atypical. Yet a pattern of decline – even from the already poor though explicable 2010 results – is also evident elsewhere. In addition to long term target wards, there are numerous wards where BNP candidates (often the same candidate) have been doggedly campaigning for several elections, achieving solid though unspectacular results. Even in these wards, which are a long way off the radar of “anti-fascist” campaigners, the pattern of BNP decline is evident. In Manor ward, Stockport, for example, Duncan Warner has contested every election since 2004, when he polled 14.8%. In the three succeeding elections Mr Warner went on to retain a fairly consistent vote of between 12.6% and 13.9%. Last year this fell to 7.3%, which might have been considered an anomaly because of the general election boosting major party turnout – but this year it fell again to 5.6%. Nearby in Reddish North ward, Stockport, Paul Bennett was fighting his fourth successive election for the BNP. In 2007 he polled 13.0%, rising to 14.6% in 2008 but falling to 9.0% last year. Once again Mr Bennett’s vote fell this year, even more substantially than Mr Warner’s, to just 4.4%. The neighbouring borough of Tameside again saw a collapse of the BNP vote. At five successive elections in the Hyde Newton ward before last year, the BNP had never polled below 24%. Last year their vote fell to 13.4%, and this year to a record low of 10.1%. Nor was their any comfort to be found in Manchester, which in recent years has been one of the country’s most Griffinite BNP branches. All five Manchester BNP candidates saw a lower percentage vote than last year. Most notably arch-Griffinite Derek Adams polled just 10.4% in the party’s main target ward Higher Blackley, where he achieved 27.0% in 2008. The region’s other Griffinite stronghold in Cumbria fared no better. In Ewanrigg ward, Allerdale, where Tina Wingfield polled 23.4% in 2007, the BNP chairman’s daughter Jenny Matthys managed only 8.5% this year. Across the Pennines the pattern of BNP decline continued. In Middleton Park ward, Leeds, where BNP candidate Kevin Meeson had consistently presented a serious challenge to Labour hegemony, reaching 37.4% in 2008, he could only manage 17.4% this year. Moreover the BNP was only able to field two candidates in the entire city this year, compared to slates of more than thirty candidates at each previous election since 2007. Less dramatically, each of this year’s BNP candidates in Kirklees polled a record low vote. In Golcar ward Skye Turner managed only 5.5%, a quarter of the BNP poll in 2006 and 2007. In Illingworth & Mixenden ward, Calderdale, considered one of the strongest BNP wards in the country and which still has a sitting BNP councillor elected in 2008, Jane Shooter finished third with 18.3%, less than half the BNP vote that elected Cllr Tom Bates in 2008. One of the few BNP candidates who polled a higher vote than last year was Marlene Guest in Wingfield ward, Rotherham, but her 17.0% was still well down on the BNP votes here in 2007 (30.8%) and 2008 (29.2%). Elsewhere in Rotherham BNP candidate Michael Burke could only manage 12.2% in Maltby, the ward where Cllr Will Blair has the unenviable task of seeking re-election next year, while Terry Fieldhouse finished bottom of the poll with 17.1% in the Brinsworth & Catcliffe ward which elected a BNP councillor in 2008 with 40.7%. One of the most notable BNP growth areas contributing substantially to the election of Andrew Brons to the European Parliament in 2009 was Barnsley, but even here there was a notable decline this year. Colin Porter in the town’s Central ward polled 11.3%, less than half the BNP’s vote in 2007 or 2008. In Darton West the local organiser Ian Sutton polled 13.4%, again less than half his 2008 vote of 28.7%, while in Monk Bretton where Jane Hubbard had polled 24.4% in 2008 and 21.3% as recently as last May, the same candidate could manage only 9.4%. Seventeen of the nineteen Barnsley BNP candidates saw a drop in their vote this year, often a very heavy one. Former BNP strongholds in the West Midlands were decimated. In Sandwell the party had fielded a slate of 24 candidates last year, but this year only contested two wards. Former councillor Russ Green failed to regain the Princes End ward that he lost last year, and saw his already declining vote collapse further from 26.5% to 14%. Fourteen of the fifteen Birmingham BNP candidates won lower votes this year, despite having no NF or other nationalist candidates splitting their vote. It was a similar story in Essex, where Thurrock BNP’s slate fell from sixteen candidates to seven. In the Tilbury Riverside & Thurrock Park ward won for the BNP by Emma Colgate in 2008, this year’s BNP candidate Mick Braun polled only 14.8%, down from 25% last year and less than half Cllr Colgate’s winning vote three years ago. Sceptical readers may believe that I am playing statistical games, but the reality is that this year’s election results can only be read one way. Detailed analysis shows that in almost every ward the BNP’s vote was lower than last year. In Newcastle the BNP contested only eight wards compared to last year’s slate of 24 candidates – and the party’s vote declined in seven of the eight. Similarly in South Tyneside six of the seven BNP candidates had a lower vote, and the slate was reduced from eighteen last year. At the opposite end of the country BNP slates again collapsed. Bristol and Swindon branches each fielded just a single candidate, compared to twelve and six last year. Each remaining candidate saw a lower vote. In fact across the whole of England only fourteen council wards saw a higher BNP vote this year than last year, despite the widespread assumption that last year’s simultaneous general election had produced unusually poor BNP percentages in the council elections. The only substantial increases were in Conisbrough & Denaby ward, Doncaster, where the BNP vote rose from 10.6% to 17.4% thanks to the English Democrats failing to field a candidate this time despite having won the town’s mayoralty; Cllr Mrs Cromie’s four-point increase in Queensbury ward, Bradford, as mentioned above; and Ronnie Bage, this year’s BNP’s sole candidate in Hartlepool, whose vote rose from 10.3% to 13.5%, no doubt helped by concentrating on this single ward rather than the five contested in Hartlepool last year. Predictably there have been feeble excuses from party chairman Nick Griffin, notably the bizarre suggestion that Labour had gerrymandered the boundaries in Stoke to frustrate the BNP’s advance, when in fact the reverse is true – the boundary changes in Stoke should actually have helped the BNP! Perhaps we should begin by acknowledging the grains of truth behind his assertions. Like any other political party, the BNP has to operate in conditions which are not entirely of its own making. There can be no doubt that Nick Griffin took over the party leadership under near ideal conditions – a nationalist “perfect storm”. A decade later, parts of the political climate have become less beneficial. In 1999 New Labour held the commanding heights of British politics, but the Labour Party on the ground – in areas that nationalists might reasonably hope to target – was often feeble. The very approach which had brought a landslide victory to Tony Blair’s party by winning over “Middle England” weakened the Labour’s appeal in some of its traditional heartlands. Blair often seemed embarrassed to be associated with the white working class, and showed little interest in the Left’s former core policy of social equality. For Blair equality meant equal rights for every conceivable minority group, not the old-fashioned socialist nostrum of raising living standards for the (white) working class majority. Labour’s activist base in many of its former strongholds was already ageing. In 2001 the beginning of the “war on terror” – the explicit alliance between New Labour and American neoconservatism – accelerated the collapse of that activist base, with many younger leftists quitting and even parts of the ethnic gravy train becoming decoupled. New Labour paid an increasing electoral price after the invasion of Iraq in 2003, with many leftist or ethnic minority voters defecting either to the Liberal Democrats or to the new “Respect” party, a unlikely coalition between Trotskyists and Islamists. Another effect of 9/11 was to increase the racial consciousness of many White British voters, though this can be overstated. I suspect that the anti-Islamist backlash only really helped the BNP in areas where there was already racial conflict between Whites and a new generation of Muslim youth prepared to engage in very un-Islamic street gang activity. (A glaring example being Oldham, where a rebuilt BNP branch fought its first council election in 2000 and achieved stunning results in 2001 and 2002.) Outside such areas the greatest electoral benefit of the “war on terror” was indirect – in weakening Labour. This electoral impact of the neocon “clash of civilizations” was played out in the context of a Conservative Party that remained divided and shell-shocked by its 1997 defeat. It could even be argued that the Tory Party took a generation to get over the trauma of Margaret Thatcher’s removal in 1990. So the “wasted vote” argument that had eased the passage of many National Front voters into the fold of Thatcher’s Tories in the late 1970s no longer applied. For most of the new millennium’s first decade the Tories were not a potential party of government, so a Tory vote was just as much a “wasted vote” as a BNP vote, often more so. Fertile ground was thus prepared for BNP election victories: in the former mill towns of East Lancashire and West Yorkshire; in the post-industrial wastelands of the Black Country; eventually in former coalfields in parts of Yorkshire and the Midlands; in the white flight zones of Essex increasingly overtaken by new waves of immigration. These ideal conditions have now expired, and to that extent there is a grain of truth in Nick Griffin’s excuses: external circumstances are no longer so favourable to the BNP as they were for a few years after 2001. We used to have a feeble Conservative opposition and a New Labour government that preferred to ignore its White working class base. We now have Conservatives in power and a Labour Party heavily focused on reinvigorating that White working class support by exploiting welfare cuts. Nationalist parties must prioritise training and support for councillors. In fact this training and support system must identify winnable council seats in advance. The party’s research and press units should focus less on promoting the cult of the leader and more on developing a handful of strong, locally relevant issues for candidates in each winnable area. Once elected nationalist councillors must be helped to build a reputation as competent and effective activists, climbing the rungs of electability in their area from credible protest vote, to main opposition, to natural holders of office and acknowledged representatives of White voters. Nationalist parties must demand the highest standards of behaviour from party officials and candidates for public office. If individuals know that they cannot withstand media scrutiny, they should admit that they are unfit to represent the party. If the party leadership knows that such people have skeletons in the cupboard – or in too many instances skeletons actually displayed in their front windows – then they should not be appointed. Nationalist parties cannot afford to be run by cronyism, and cannot afford to exclude our best activists for reasons of factional or personal spite. If the party chairman is so insecure that he cannot tolerate potential rivals working within the party structure, then he is unfit to be chairman. It is a tragic reflection on the state of the BNP that such an obvious truth should have to be expressed. To take the most glaring example: it is farcical that the BNP should be depending on the likes of Clive Jefferson to run its election campaigning, while Eddy Butler – the most successful nationalist electoral campaigner in modern Britain – is marginalised. Nationalist parties must harness the talents of the best available individuals in our ranks. The cult of the leader is far less important than the need to build a successful leadership team. The most glaring failure has been among those who saw the BNP’s crisis as an opportunity for ideological purification. The British Freedom Party sought to narrow the definition of “nationalist”. Following the example of several splinter groups since the 1970s, the BFP believed that the movement should be purged of “nazis”. Yet far from offering a pragmatic alternative, the BFP has failed even to get off the ground, and it is unclear whether its leaders even believe in the electoral path. In this respect it has been even less successful than the most extreme of its polar opposites, the very small and explicitly national socialist British People’s Party, which did at least manage to field a candidate for Calderdale Borough Council, and improved its percentage vote from last year. A different form of ideological purity is offered by the National Front, which has been reinvigorated in recent years by a modest influx of activists from the John Tyndall wing of the BNP, including veteran nationalist Mike Easter. The NF has a few effective electoral units, though its West London activists, led by party chairman Ian Edward, had no election this year. In North Tyneside the NF’s longstanding candidates Bob Batten and Mark Nicholls polled 11.3% and 7.5% respectively, up from 8.0% and 4.6% last year. It would be idle to pretend that these results were any sort of electoral breakthrough, but neither could they be described as “uniformly pathetic”, the dismissive term used by Nick Griffin in the past to contrast the NF’s supposed failure with his own party’s supposedly unique formula for nationalist success. At least the increased number of candidates could be seen as a sign of NF progress in Hull, whereas in the North West the party will surely be disappointed by the failure to recruit significantly, even after the defection of two prominent BNP activists (Kev Bryan and former regional organiser Chris Jackson) in December 2009. Chris Jackson polled a creditable 4.9% for the Front in Rochdale at last year’s general election, the best ever nationalist vote in that constituency. But this year the NF’s only council candidate in the borough (former BNP branch organiser Peter Greenwood) finished bottom of the poll with 7.0%. The only other NF candidate in the North West was Kev Bryan, who polled 12.8% in Irwell ward, Rossendale, a slight increase from last year’s 11.6% – but one should bear in mind that Mr Bryan has been contesting this ward regularly since 2006, when as a BNP candidate he polled 30.5%. Even at the 2008 election (by which time the BNP had begun to decline locally) he polled 23.9% here. If the North West’s NF performance was modest, the case against the NF as a credible future for nationalism is settled by the party’s failure in two other areas. In Leeds and Bradford a group of veteran activists led by Eddy Morrison joined the Front a couple of years ago after decades of service to various nationalist parties. Mr Morrison is now a prominent NF official and editor of several online and hard copy publications, and though he may regard himself as having fallen out with me I persist in viewing him as a good nationalist who at his best has made great contributions to our cause. Yet it has to be pointed out that despite the collapse of the BNP in Leeds and Bradford, not a single NF candidate contested this year’s elections in either city. Even more seriously there was not a single NF candidate in Birmingham this year, again despite BNP decline. Even in the NF’s worst years Birmingham had remained one of their few active branches. Its extinction is a sad day for nationalism and shows that while individual NF activists will have much to contribute towards a nationalist renaissance, there is no real case in favour of the post-Griffin movement regrouping under the NF banner. Like the NF candidates in North Tyneside, England First Party candidates have demonstrated at successive elections that a BNP label is not a prerequisite for nationalist success. This year party chairman Mark Cotterill increased his vote in Ribbleton ward, Preston, from 12.5% to 15.5%, while the six EFP candidates in Stoke polled between 6.1% and 19.2% (the latter result for Mark Leat in Sandford Hill ward was the second best vote for any nationalist party in any Stoke ward this year – up from 10.3% in the equivalent, larger ward last year – and beaten only by outgoing BNP group leader Michael Coleman’s 24.3%). These results were achieved with virtually no financial resources. One important aspect of the EFP’s credible election results (which have included electing two councillors in Blackburn with Darwen and defeating the BNP on most of the occasions where the two parties have clashed in the past) is that English cultural identity and imagery can have an important role in enhancing nationalist electoral appeal. Both the BNP and the NF leadership have made a great fuss about rejecting English nationalism as part of a supposed commitment to the Union, even though in Nick Griffin’s case this supposed commitment is meaningless and will be ditched as casually as changing his tie. This year’s elections demonstrated conclusively that the BNP has no chance of winning seats in Wales, Scotland or Northern Ireland. Nick Griffin endlessly talked up his party’s chances in the Welsh Assembly elections, largely to solicit donations from gullible party supporters who were told that one more fundraising appeal might make the difference, in elections where after all the PR system did favour smaller parties. Yet in four of the five Welsh regions the BNP list was defeated not only by the major parties but by Arthur Scargill’s minuscule Socialist Labour Party! In all five regions the BNP lost to UKIP, having been ahead of UKIP in four of the five last time. In purely electoral terms, those nationalists who target the entire United Kingdom have no advantage over English nationalists. Another form of English nationalism is represented by the English Democrats, who after rejecting any association with racial politics for most of their existence recruited a number of the BNP’s best candidates and activists this year. This move was applauded (and to an extent orchestrated) by Eddy Butler, who as mentioned above has been this country’s most effective nationalist election strategist, but its electoral impact is not easy to assess. The most high profile ED ex-BNP candidate was Chris Beverley, who still works in the office of BNP MEP Andrew Brons and was a BNP councillor for Morley South ward on Leeds City Council from 2006 until 2010. Mr Beverley clearly believed he could win back the ward that he lost last year, but it was a tall order to build a winning campaign under a new party label adopted just weeks before polling day. In the event he finished third with 19.6%, slightly down from the 21.2% he polled last year. Mr Beverley faced unusual challenges in his ward due to the presence of the Morley Borough Independents. This is one of several such parties that have sprung up in different areas, reflecting continued resentment at the effects of the 1972 local government reorganisation which forced many historically independent boroughs into being absorbed by larger neighbours. Morley was absorbed by Leeds, just as in Lancashire the historic resort of Morecambe was absorbed by Lancaster and Darwen was tagged onto Blackburn. All three cases spawned political parties, and in the case of the Morecambe Bay Independents and the For Darwen Party these groups actually took power for brief periods in their respective town halls. The success of such parties (even if short-lived) tells us something about the resilience of local community spirit and local cultural identity: these cases should be studied carefully by nationalists, however much we may despise some of the opportunists and petty careerist politicians who lead some of these movements. So far as this year’s elections were concerned, Chris Beverley and the EDs failed to win back the votes lost to the Morley Independents last year. MBI finished a close second to Labour in Morley South, again pushing Mr Beverley into third place, and held onto Morley North, where Mr Beverley’s colleague Tom Redmond polled 8.3%, slightly down on the 11.3% he achieved as a BNP candidate last year. Two conclusions can be drawn from these results. First: that the strong BNP results in these wards (including Mr Beverley’s victory in 2006) were not part of some uniquely successful BNP brand. Second: that contrary to some of the arguments advanced by those who favoured mass defection to the EDs, this strategy did not amount to a successful escape from a contaminated BNP brand. Of course we will never know for certain, but I suspect that had Messrs Beverley and Redmond fought their wards again this year as BNP candidates, then they would have achieved about the same results this year as they did as EDs. Strong support for this theory comes from the Ardsley and Robin Hood ward of Leeds, contested again by Mr Beverley’s wife Joanna. Last year as a BNP candidate Mrs Beverley polled 13.8%. This year as an ED her vote improved slightly to 15.0%, but this improvement was entirely due to the collapse in turnout. Notably this year’s ED campaign failed to dent the UKIP vote in the ward, which remained virtually steady numerically and increased from 3.9% to 6.6%. If there was going to be any special benefit to escaping a “contaminated” BNP brand and standing under the more “respectable” ED ticket, then we should have seen it in this ward, where UKIP candidates have consistently been bottom of the poll. In 2008 the UKIP vote denied Mrs Beverley the chance of joining her husband as a BNP councillor, when she lost by just eleven votes. In Ardsley and Robin Hood ward there was an ideal opportunity to test the theory that nationalists could extend their appeal by trading in the “tainted” BNP label for a more voter-friendly ED label. Yet the result was that the UKIP vote – despite being quite clearly a wasted vote – remained far more solid than Mrs Beverley’s BNP/ED vote. Predictably the Liberal Democrat vote collapsed, as it did across Leeds and indeed across most of the North of England, but the Conservatives comfortably held on to second place in the ward. The only ED success this year came in Boston, where two ED councillors were elected in Fenside ward. Like Morley this is an area where politics has been complicated by the intervention of a strong independent group, in this case the Boston Bypass Independents, a party that grew out of a local campaign for a new bypass road in the Lincolnshire town of Boston in 2006 and swept to power in the town in 2007. This BBI party failed in office, partly because of internal splits, and suffered heavy defeats at this year’s elections, mostly to the Conservatives. In November 2008 the BNP’s David Owens benefited from the already evident decline of the BBI, gaining one of the Fenside ward seats at a by-election, though failing to make any gains in the area at the Lincolnshire County Council election the following May. This year he successfully defended his seat as an English Democrat, and was joined by fellow BNP defector Elliott Fountain. These were undoubtedly strong results for the EDs, and in fact they are the first borough councillors ever elected as English Democrats, but we should not overstate their national significance. Fenside is a very small ward with around 4,900 electors compared to Chris Beverley’s electorate in Morley South, for example, which is 16,660. Therefore the EDs faced a much easier task putting across their message during a three or four week election period. None of the other ED candidates in Boston were known to have any past BNP affiliation, but none of them were elected. While the ED results were far from disastrous, they do not offer evidence that a mass defection to the EDs is an obviously attractive move for disenchanted BNP members. There are of course other problems with the ED route. A large faction within that party will undoubtedly resist the decision by party leader Robin Tilbrook to accept these new arrivals from a racial nationalist background, given that ED policy has always been determinedly non-racial. Mr Tilbrook will have considerable ammunition from this year’s results to fend off any internal revolt. He will be able to point not only to the two new Boston councillors but to strong results in other areas achieved by ex-BNP ED candidates, which compare very favourably to the votes won by longstanding English Democrats in other wards, “untainted” by any racial nationalist past. The Leeds results have already been mentioned. In the Hertfordshire borough of Broxbourne a slate of four ex-BNP English Democrat candidates, including former councillor Ray Johns, polled between 11.6% and 28.1%. This latter result was in Cllr Johns’s old ward of Rosedale, where the BNP polled over 40% in the 2003 and 2006 elections. Meanwhile in Earby ward, Pendle another BNP defector to the EDs, James Jackman polled 12.3%, only very slightly down on the 13.6% he received in the same ward last year as a BNP candidate. (Incidentally Mr Jackman was also elected unopposed as an ED parish councillor.) In Solihull two BNP defectors won modest votes standing as EDs, one slightly up on last year’s BNP vote in the same ward, the other polling only 3% compared to last year’s BNP vote of 6.1%. Most of the BNP defectors’ results however compare favourably with those achieved by longstanding English Democrats with no “racist” past in wards which have long been targetted by the party, in boroughs such as Doncaster, where the Mayor is an English Democrat but where there are still no ED councillors, the highest ED vote this year being 23.3%. In other ED target areas, their highest poll in Rochford was 22.9%, in Medway 13.9%, and in Dartford 21.2%. The party will also be pleased to have beaten the BNP for the second time in Denby Dale ward, Kirklees, where the BNP candidate was the Kirklees branch organiser for her party, and to have beaten UKIP in two Salford wards as well as in their first ever Tameside campaign. In Liverpool there was further evidence that a BNP past is no significant handicap for an ED candidate. Former BNP European parliamentary candidate and former Liverpool BNP organiser Steven Greenhalgh polled 4.3% in the city’s Central ward, while the two ED candidates in other Liverpool wards with no former BNP association polled 0.7% and 1.4% respectively. Conversely in St Michael’s ward, Liverpool, a former BNP candidate, Dr Paul Rimmer, polled 1.8% for UKIP, more than double the vote of an ED rival who had no BNP links. Somewhat surprisingly given the modest electoral record of the Democratic Nationalists, they easily outstripped the EDs in Bradford, firstly by fielding three candidates compared to the single English Democrat, and second by achieving generally better votes. Andrew Clark was the ED candidate in Wibsey ward, which he had twice fought previously for the BNP, finishing runner-up with 30.4% in 2006 and 27.8% in 2007. This year he polled only 6.5% as an English Democrat and finished bottom of the poll – in a ward where seven years ago the BNP had managed to win one of the three seats in the all-out election of 2004. Neil Craig of the Democratic Nationalists was similarly contesting a ward that had elected a BNP councillor in that 2004 contest. Mr Craig polled 10.9% in Wyke ward, showing a slightly better relative performance to Mr Clark’s for the EDs in Wibsey, though again well down on the votes of around 28% achieved by BNP candidates here in 2006 and 2007. The other two DemNat candidates were Liam Kernaghan, who polled 6% in Tong ward, and former councillor Dr Jim Lewthwaite, who achieved his party’s best result, 11.3% in Royds, a ward where the BNP had polled over 30% in 2006 and 2007. Given the dramatic decline of the BNP in this city during the intervening years, both the DemNat and the ED results are broadly in line with what one might have expected had the BNP limped on rather than collapsing totally (outside Cromie territory). But they do indicate that the ED label alone brought no special advantage. A final category of BNP defector was the handful of candidates resisting any of the alternative party labels on offer and standing as independents. They achieved mostly disappointing results. Former BNP parliamentary candidate Neil Whitelam achieved a respectable 543 votes in the SE Holderness ward of the East Riding of Yorkshire, but in Primrose ward, South Tyneside, the four-time BNP candidate Pete Hodgkinson managed only 4.3% as an independent in a ward where he had previously polled as high as 32.9% for the BNP. Similarly in Short Heath ward, Walsall, three-time BNP candidate Malcolm Moore polled only 4.9% as an independent in a ward where he had polled between 17.5% and 22.1% for the BNP. In a three-vacancy election for Ibstock and Heather ward, NW Leicestershire, Ivan Hammonds stood as an independent this year and finished seventh of ten candidates with 420 votes, 273 votes behind the lowest elected Labour candidate. By contrast in a December 2008 by-election for the same ward, which Mr Hammonds contested for the BNP, he had finished runner-up with 30.8%, only fifteen votes behind the winner. The only candidates who achieved reasonably strong results as independents were two sitting councillors originally elected under BNP labels. Graham Partner in Hugglescote ward, NW Leicestershire, who had been elected top of the poll in 2007 with 449 votes (and who remains a Leicestershire county councillor) saw his vote fall to 270 this year as an independent, finishing fifth of ten candidates in a two-vacancy ward, though his share of the poll still works out at around 20%. Meanwhile the former deputy leader of the BNP group on Stoke City Council, Tony Simmonds, polled 30.9% and finished runner-up in the new Broadway & Longton East ward, though we should bear in mind that this is a small ward created after boundary changes, and it was therefore more practical for ex-Cllr Simmonds (who was to put it kindly a difficult colleague for his fellow nationalists) to get his message across to voters. So much for the electoral facts, which seems to offer no conclusive evidence to push nationalists in any direction. Smaller nationalist parties – even “extremist” ones, polled perfectly respectably in comparison to the BNP. In some cases, notably EFP chairman Mark Cotterill, their votes showed slight increases from 2010, compared to an almost universal BNP decline, both in numbers of candidates and average vote. Those nationalists who defected to the English Democrats did not poll noticeably better than those who stayed with the BNP, but neither did they perform noticeably worse. While many internet wiseacres had predicted that the EDs would pay an electoral price for embracing “extremists”, the reverse appears to have been the case. The new BNP recruits, no doubt because of their campaigning experience compared to some other EDs, achieved relatively good results and two of them were actually elected, becoming the first ever ED elected borough councillors. Predictably the worst option for any nationalist candidate is to stand as an independent, since unless you are a sitting councillor with an established personal record and/or you are operating in a very small ward, it is much more difficult without any party label to get your message across to significant numbers of voters. What we can conclude from this year’s elections is that the long decay of the BNP has clearly destroyed any hope of Nick Griffin’s party winning back electoral credibility, but no other nationalist party can present itself as the most obvious and credible alternative. One danger in such circumstances is that large numbers of activists will simply drift away and abandon electoral politics – in fact many have already done so. Another danger is that those who choose to remain politically active will allow shades of ideological difference, hobby horses or personal friendships to push them into as many as half a dozen rival parties or movements. Again this trend can already be discerned. There is only one way to rescue the nationalist movement from the consequences of Griffinite implosion. A clear lead is required from the most senior and widely respected figures in our movement. The BNP leadership campaign of Richard Edmonds has made a very good start in this direction, since despite the fact that Richard Edmonds is best known as the leading lieutenant of the late John Tyndall, his campaign has incorporated leading figures in the party who are far distant from the Tyndallite tradition: relatively new converts to nationalism such as Michael Barnbrook, former Conservative academic Sam Swerling, and former Griffinites such as NF veteran and former East Midlands BNP regional organiser Geoff Dickens. Such a broad coalition will have to face up to difficult choices regarding ideological direction and detailed policy proposals. I will attempt a few signposts on these and other matters in a forthcoming address to the New Right. But we should remember that it is not ideological division or policy minutiae that have brought down Nick Griffin’s BNP. Rather that party has been destroyed by financial corruption, authoritarian factionalism and cronyism – familiar enough problems in politics, but seen at their very worst in Nick Griffin’s BNP. Nationalist parties must prioritise training and support for councillors. Richard Edmonds has pointed the way forward. It is for other leading nationalists inside and outside the ranks of the BNP to decide how they can best contribute towards the rescue of the movement. I strongly suspect that the BNP is holed below the waterline, and that either constitutional finagling or financial collapse will intervene to prevent Richard Edmonds and his team from completing their rescue operation. If I am right, then senior figures in the BNP should right now be preparing clear statements that they are prepared to stand alongside Richard Edmonds and his team, either in a rescued and rebuilt BNP (which I regard as an almost impossible proposition) or in a new post-Griffin coalition. The need for such a clear statement is urgent. If nationalism continues to drift through the summer, there might be little left to rescue of the party that elected two Euro MPs in 2009.